There were specials in connection with steamers, e.g. the Lloyd-Expresszug for Oesterreichischer Lloyd, from 1896 also CIWL sleepers Alexandria - Cairo, traction by 4-4-0 engines, painted maroon, from 1926 also CIWL “Pullman” day saloons. 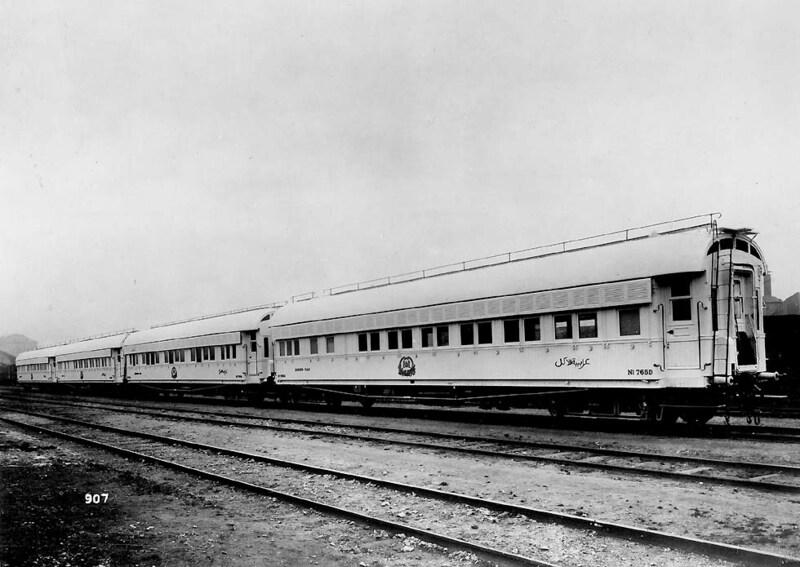 Around 1936 a Rapide Cairo - Alexandria consisted of 2 cars 1st class, 1 CIWL Pullman, 3-4 cars 2ns class. The first “Pullman” cars were nos. 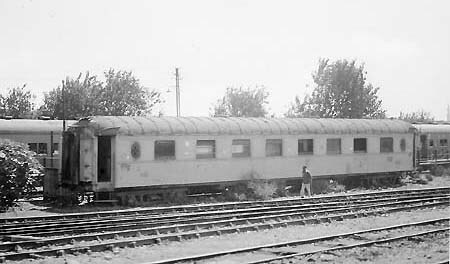 54-58, built for the Pullman Car Co., used by CIWL initially in Italy, new cars 2914-17, 4171-76, 4088. CIWL cars generally became cream colored. In 1950 the Pullmans were sold and then used as diners. Traction: From 1900 4-4-0 and Atlantics replaced the single-drivers, much later came tenwheelers and in 1955 Pacifics from SACM, France, probably the most modern European steam engines. In 1948 however the first English Electric diesels entered service with Alexandria - Cairo trains and from 1960 General Motors and Henschels arrived. Ganz-Mavag diesel railcar units were replaced in 1982 by Turbotrains from Francorail. Alexandria - Cairo could be suitable for high-speed services. Colors: Steam locomotives initially with various paint schemes, then generally black, Pacifics green/black. Diesel green, blue, then silver, Turbotrains black/white/red. Cars 763-768 were built by Ringhoffer. Colors: ESR and CIWL cars until the '50s cream-colored. Interrupted during WWI until 1922. Connecting train Luxor - Shellal on Cape gauge, including sleeping cars, 4-4-0 type locomotives, at Shellal steamer connection to Sudan. 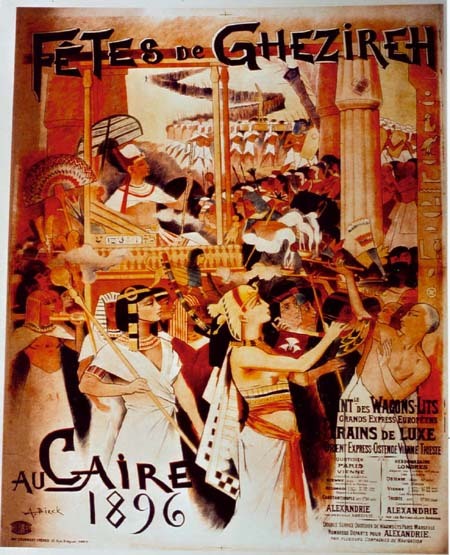 CIWL de-Luxe, day train Cairo - Luxor from 1929, "Pullman" saloons 4171-76, occasionally the older 2914-17, until WWII. CIWL de Luxe from December 1926 Cairo - Shellal, from 1928 cream colored all-steel sleepers type S, nos. 3570-77, interrupted during WW II, temporarily combined with normal trains, diner then obviously from the royal train, from 1964 no CIWL service, from c. 1967 Cairo - Aswan with WL and WR from Hungary, grey/light-grey. From the '60s diesel traction, mostly CoCo from GM, dark green. These new train sets built by MBB for service by CIWL were introduced in 1980. If required, there was a similar Rapid 85 Cairo - Luxor, later 3 trains Alexandria - Aswan, Cairo - Aswan und Cairo - Luxor by AT,then Abela Egypt, running “when required”. 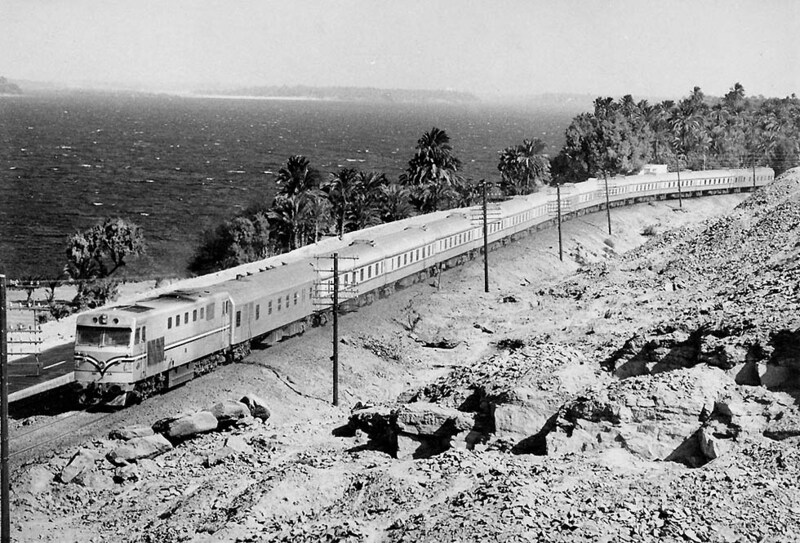 A regular train service continued connecting Alexandria with Aswan. Also cars built in East Germany and in Spain were introduced, new colors light-gray and pastel/red. A rail connection with the Sudan is still a proposal. Nile cataracts initially were circumvented by the Sudan Military Railway. After completion of the Cape gauge line Wadi Halfa - Khartoum in 1900, the 1st class passengers from Egypt could use a simple sleeping-car, a small diner, a wagon rebuilt with a bath, the energy being supplied by an open generator wagon. 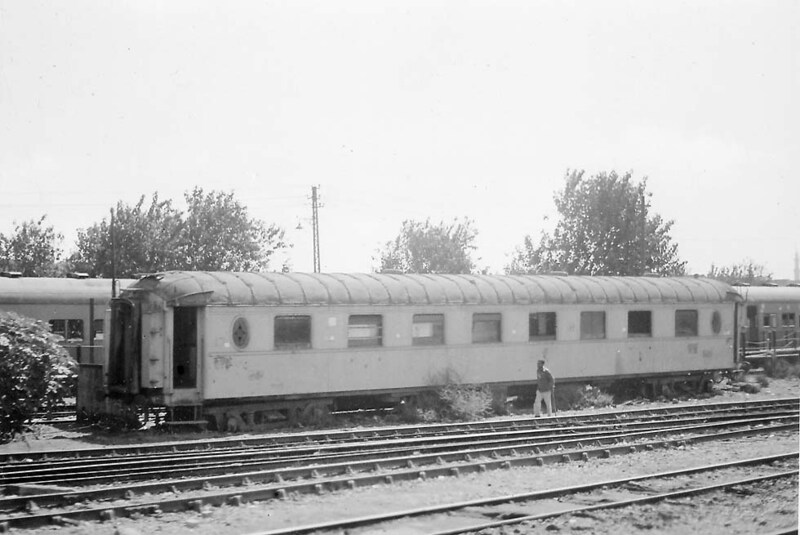 Richard Hill mentioned in his excellent book "Sudan Transport" (London, 1965) the project of 1901 of a tourist train with CIWL cars, which did not materialize (historian Roger Commault had not found documents in the CIWL archives). 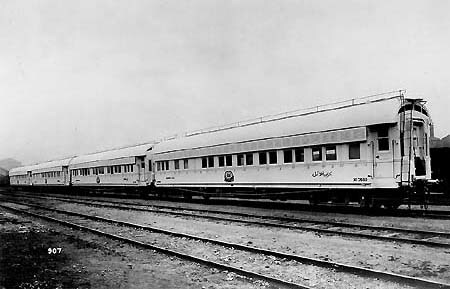 Expresses generally consisted of wooden sleepers, a sleeper/buffet car or a diner, coaches and vans of the Sudan Government Railways. 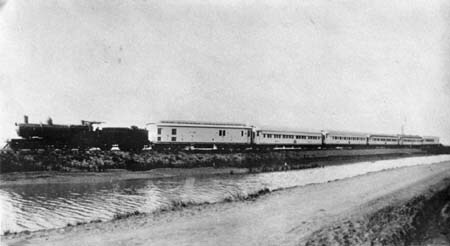 At least before WWI there was also a "boat-train" Port Sudan - Khartoum. Later occasionally a motorcar transporter (a simple freight wagon) appeared. In the '70s the first all-steel cars were delivered from Hungary and then also second-hand cars from Germany. Colors: cream, all-steel cars with a yellow, orange or green stripe. 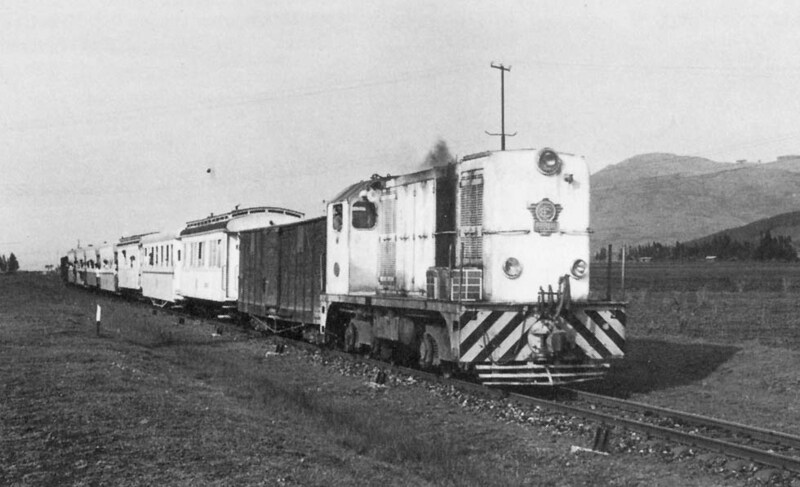 Traction: Initially 2-6-0 (Sobat class), from 1910 Atlantics, after 1927 Pacifics, around 1960 Mikados. 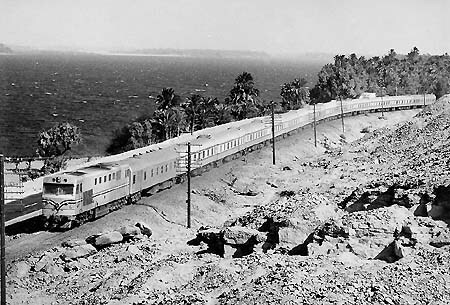 The Pacifics from 1955 as well as the Mikados hauled the Port Sudan Express. From c.1962 diesels from Europe, then Hitachi, General Electric, Henschel, General Motors. Colors: steam locomotives blue, diesels with various color schemes. Colors: locomotive blue, cars cream, new cars with green line. During the '80s and '90s a Super Express Khartoum - Atbara - Bur Sudan (Port Sudan) appeared in the timetable, with sleeper, diner, 1st and 2nd class, then only a twice-monthly train Atbara - Bur Sudan (Port Sudan). 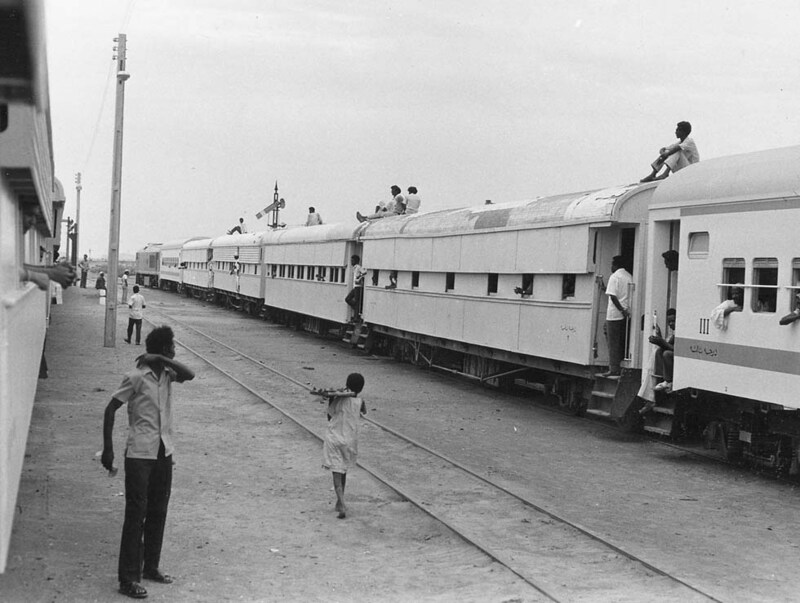 Also the train Wadi Halfa - Khartoum was reduced to two departures monthly. Services Khartoum - El Obeid and Nyala still appeared in the timetable. Ethiopia could be reached only by steamer via the harbor Djibouti, a French colony. 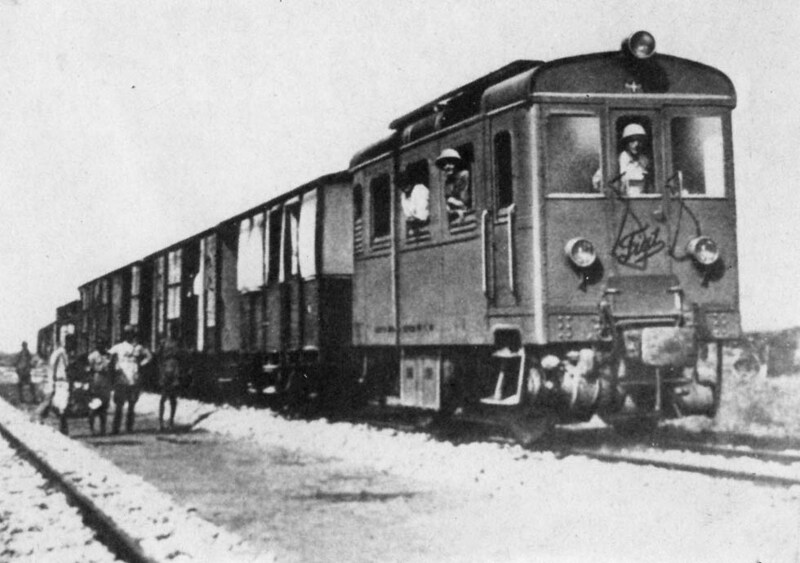 In 1917 the meter gauge line Djibouti - Addis Abeba was completed. 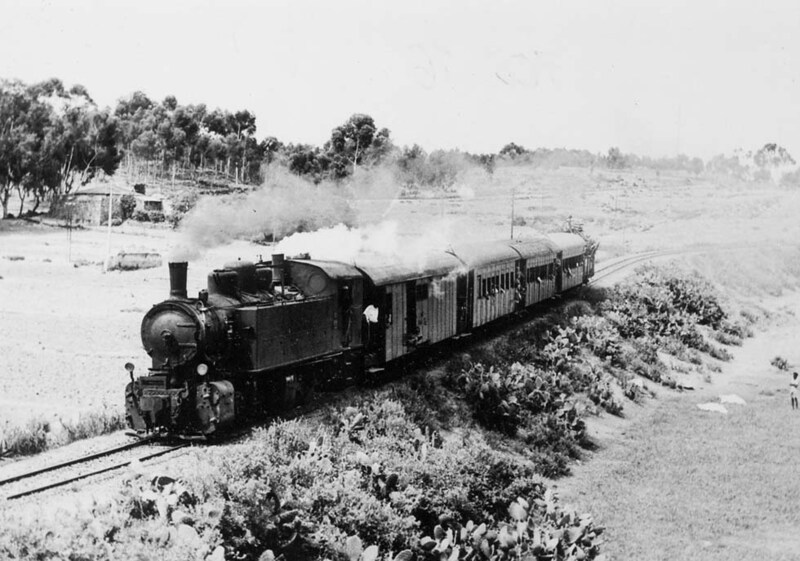 England had reserved the right to extend the line to the Sudan, but it was never built. The 1st2nd class cars were from 1900, the first LAc from 1913, newer ones and AcB from the '20s. Around 1955 French diesels had replaced steam. There had been four Pacifics, nos. 231-234, the first one originally ordered by Madrid - Aragon - Tajuna. According to Lartilleux the Pacifics and MacArthur type Mikados.hauled the "trains directs". 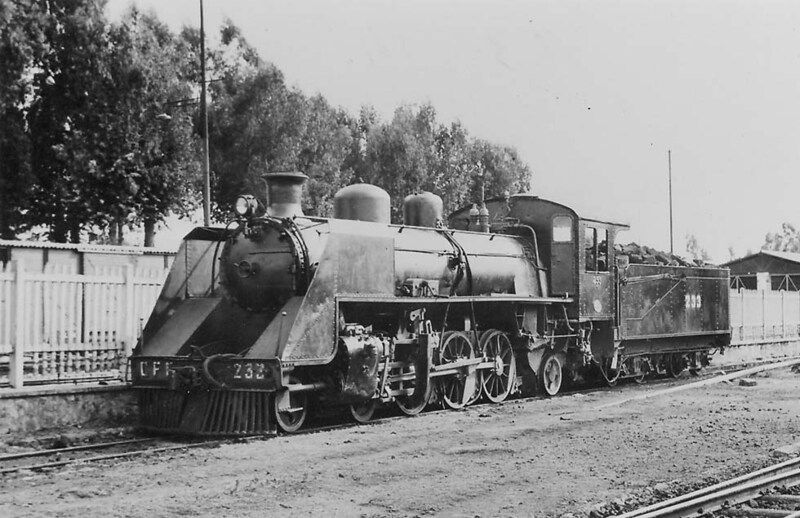 There was a variety of locomotive types, including 2-8-2+2-8-2 Garratts from Ansaldo. After the turn of the century a train Addis Abeba - Dire Daoua still appeared in Cook's timetable, but the connection to Djibouti "may be suspended at any time". Then trains to Addis Abeba were stopped and Cook’s Overseas Timetable described the Djiboti route as “one of the most dangerous trips in the world”. Italy had occupied Eritrea and during WWII Ethiopia. 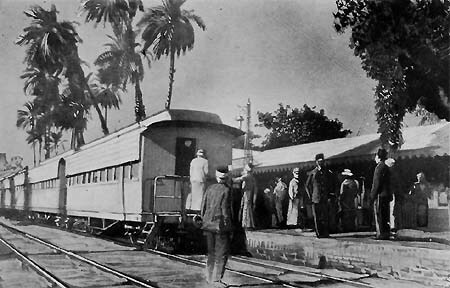 On the 95cm gauge in Eritrea in the first years of the 20th century ran a once-monthly "postale" Massawa - Saati after arrival of the steamer. In 1935 Italy introduced Fiat "Littorine" railcars. Now in Eritrea rail services revived - with steam. Early plans to connect Eritrea with Italy’s other colony Somalia were not realized. Only a regional 95cm gauge line Mogadiscio – Villa Duca degli Abbruzzi was completed in 1927. Fiat diesel engines were in use and a service with “Littorine” was planned (according to Giorgio Gatti: Le Ferrovie Coloniali Italiane). Of course war-ridden Somalia has no railway now. A fantastic project to connect Arabia with Africa was published in 2008. According to news magazine Der Spiegel a rail and pipeline bridge between Yemen and Djibouti is a proposal by Sheikh Tarik Bin Laden, head of the Middle East Development LLC.